Some northeast Ohio families are calling for greater state cemetery oversight, after they reported emotional customer service issues during recent funerals for their loved ones. Donna Williams was just one of seven local families who reported service issues to Resthaven Memory Gardens to News 5 over the past 18 months. Williams lost both her mother and father in just 73 days, and said Resthaven made it tough on her family when it tried to add fees and refused to allow an outside monument company to set-up the headstone for her parents. Williams said the situation triggered an emotional battle that lasted four months, with Resthaven finally allowing an outside monument company to handle the creation of the headstone. "We needed someone to guide us through this, empathy, sympathy, condolences, not someone reaching into our pockets," said Williams. "They were going to charge me additional fees, and that their grounds keeper crew was going to put in my parents upright marker." Mary Smelcer said she will soon file a lawsuit against Resthaven and is working toward having her husband's body removed from the Avon cemetery after she said the cemetery was unprepared and was disrespectful during her husband's Aug. 24 funeral. "It was a horrible, it was a horrible sight," said Smelcer. "There was nowhere to sit, there was no tent for us to sit under, there was a digging machine sitting there." Former Resthaven customer advisor Brittany Halligan said she quit in 2017 after she said the cemetery seemed more concerned about sales than customer service. "It was very difficult, that was why I left, I morally could not continue working and doing that to people," said Halligan. "But it's not one, two, three or four cemeteries, this is a wide spread problem." Jim Milano, President of Milano Monuments, told News 5 a growing number of Ohio cemeteries are facing financial distress. Milano said more northeast Ohio families are turning to cremations, and that loss of revenue is helping to create more customer service issues. Milano said more oversight from the Ohio Cemetery Dispute Resolution Commission is needed to deal with growing problems. "When these things happen it puts a cloud on the whole industry," said Milano. "What no one saw coming was the rise of the cremation rate. In Cleveland, roughly we're at about 55 to 60% cremation." 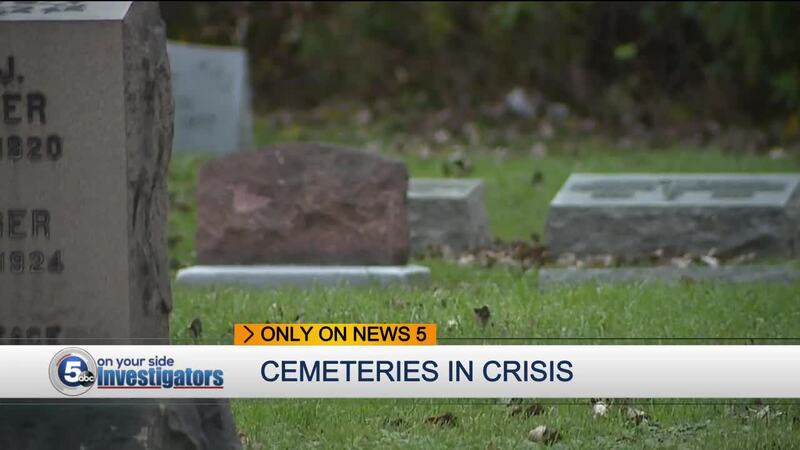 "I think there should be inspections and really an audit at Ohio cemeteries," Milano said. The Ohio Department of Commerce said it is responding, hoping a new law under HB 168 will help improve cemetery oversight. The law sets-up seven new standards for improved reasonable maintenance at Ohio cemeteries. Resthaven parent company StoneMor Partners LP told News 5 it is also working to make improvements. "ResthavenMemory Gardens' mission is to help families memorialize every life with dignity, including providing and maintaining a tranquil and beautiful place for memorialization. In some instances, we have fallen short of our standards.These matters are being addressed, and we want to reassure our families and the local community that we are committed to serving them and their loved ones.". Meanwhile, Mary Smelcer is hoping annual inspections and even tougher guidelines at Ohio cemeteries will soon be on the way. "I just don't want anybody else to have to go through this ever," Smelcer said. "It's horrible."